WHERE SHALL I FLY NOT TO BE SAD, MY DEAR? recorded by michael thieke may 2004 in berlin. 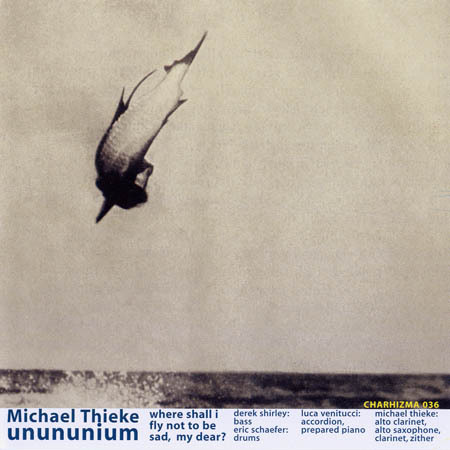 all compositions by michael thieke except 1,3,8 by unununium. Joined by bassist Derek Shirley, drummer Eric Schaefer and Luca Venitucci on accordion and prepared piano, clarinettist and alto saxophonist Michael Thieke's latest offering, Unununium, marks something of a move away from the lowercase extended techniques of his recent outings on Creative Sources, Leuchten, Kreis and Schwimmer back to – gulp – jazz. (Not that this will come as a surprise to those familiar with his work in Nickendes Perlgras and Demontage, both of which also feature Schaefer). But jazz is just one of many languages spoken here: "Portnoy" explores territory familiar to devotees of Berlin / Vienna micro improv, with ghostly clanging gongs, growling low register bass (shades of Werner Dafeldecker) and Thieke's delicate wisps of breath, but it's bookended by "Funf Treppen", which alternates walking bass ostinatos and trucking 4/4 metrics with sections of rapid fire fluttery free jazz deftly illuminated by flurries of accordion clusters from Venitucci, and the Cage-like sonorities of the prepared piano on "Der Idiot". Thieke's terrific alto clarinet work on "Nach Aussen Gewölbte Mönche" is a timely reminder that many of Berlin's most daring instrumental innovators – trumpeter Axel Dörner most notably – are just as good at playing straight and swinging hard if they put their mind to it. The Shirley / Schaefer rhythm team is outstanding here, laying down a spiky free funk groove on top of which Venitucci and Thieke really get cooking. Surprises abound throughout this album, from the laidback lope of "Der Verfolger" to the exquisite microdrones and tingling glockenspiels of the tiny, perfect "Element 110" and the pointillism of the closing "Einen Käfer Werfen". All in all, Unununium is a magnificent piece of work by four musicians at the height of their powers in a vibrant new music scene documented by an essential label. A debut from one of Thieke's many projects. Thieke is a german improvisor who lives in Berlin and Rome. With this new cd Thieke brings together the best from both worlds. Unununium is a quartet of Derek Shirley on bass, Eric Schaefer on drums, Luca Venitucci on accordion and prepared piano, plus Michael Thieke on alto clarinet, alto saxophone and zither. They play jazz in a non-jazz manner. Meaning no swing? In a way surely yes, but it depends how you look at it. They play in a 'less is more'- style and succeed in being very effective that way. The music is full of humor, pleasantly (un)pretentious and poetic, which make this a very sympathetic quartet. The playing is fresh and pure. Some pieces are built upon a very straight rhythm, and because of the odd instrumentation they remind me of some of Steve Beresford's projects like 49 Americans and The Alterations. Just listen to 'Fünf Treppen' or 'Der Idiot'. The prepared piano and little percussion sound as children toy-instruments. 'Nach aussen gewölbte Mönche' - what a tittle! - has Unununium at their most energetic and hectic level. The music jumps from one corner to another. Here the music really takes of. But this quartet has also another side. Pieces like 'Portnoy' and 'Mmm' are spheric improvisations that are investigations in soundcollage and texture. Also most of the other pieces move slowly forward built on little motives that are repeated over and over, but not literally. In the case of 'Ein Käfer werden' the music is to introspective, and fails to catch attention from beginning to the end. Considered as a whole the music on this cd is clearly structured and transparent. The players make up a good team and share the same musical vision and way of playing. They have everything under control. Schaefer is a great drummer, known from other projects with Thieke as well (Nickendes Perlgras). Luca Venitucci on accordion and prepared piano was the greatest surprise for me. But the best thing you can do is to surprise yourself with this cd. It is worth it. One of the most intriguing reed players around today shows his compositional wisdom through a systematic deployment of sparse elements in rather ample structures, which allow Derek Shirley (bass), Eric Schaefer (drums) and Luca Venitucci (accordion, prepared piano) to entertain advanced dialogues with Thieke, who plays zither in addition to clarinets and saxes. Music with a sort of visual appeal - like a photographic representation of four different musical paths sharing mutual links - incorporating transparent architectures based on a common denominator of sustained tensions, inquisitive scrutiny of the instrumental peculiarities and perfect individuation of the breathing rooms. Even in the most suggestive inventions, coherent delicacies prevail over abstruse difficulty, keeping the comprehension degree at an accessible level while yielding a lyricism whose exhalations pervade the whole album. Not necessarily in dramatic fashion, Unununium present some unusual perspectives without overly trespassing the borders; this CD is probably the best showcase of Thieke's universe until now. Clarinet and alto saxophone player Thieke splits his time between Rome and Berlin, where this session was recorded in 2004. He‘s joined by Italian accordionist Luca Venitucci, bassist Derek Shirley and drummer Eric Schaefer. The reedy combination of Thieke and Venitucci elaborates outward from quite basic melodic material, executing agile twists, turns and changes of tempo, edging often into abstract moods and textures. Shirley provides a firm core for the music‘s shifts of character and the melodically inclined Schaefer proves to be a useful colourist too. This music doesn‘t clamour for attention, but it succeeds on its own discreet terms and there‘s plenty to sustain interest. What characterizes saxophonist/clarinetist Michael Thieke’s music throughout this thoroughly engaging CD is its bristling intelligence. Each piece is the result of a penetrating gaze at the possibilities inherent in the musical seeds found in the compositions themselves. His quartet’s sound, comprised of round-toned bass by Derek Shirley, colourfilled accordion and prepared piano by Luca Venitucci and lucidly conversational drums by Eric Schaefer, spans an orchestra’s textures and sonorities ranging from gamelan metals to woody resonances and breathy whispers of woodwinds. While this is free jazz, the strength of each piece comes from the freedom with which its solid structure is explored by the four gifted improvisers. This isn’t a blowfest of the ecstatic school. Nor does indulgence in the tentative twitters of the minimalist approach. Its’ full-throated playing is passionate without becoming hysterical, abstract without becoming vague or impenetrable. From the rolling tom-toms and insistent bass of "Fünf Treppen" to electroacoustic pinging in "Element 110" to the exotic triptych "Der Idiot", Umumumun reveals an imaginative world filled with surprising locales and intriguing inhabitants. That Thieke recorded one of the most intimate, best sounding jazz CDs in recent memory himself is further evidence of his impressive talents. Highly recommended. Clarinet and alto saxophone player Clarinetist Michael Thieke has come into recognition through various projects he's been involved in various collaborations with Billy Bang, Olaf Rupp, Eric Schaefer and Gebhard Ullmann's Clarinet Trio. I stumbled onto his music through Nickendes Perlgras, a band he'd founded in the late 90's. Rich and warm music is what drew me into the Thieke universe. His new quartet Unununium presses many of the same buttons his others collaborations have in the past. Made up of Thieke on various wind instruments, bassist Derek Shirley, percussionist Eric Schaefer and accordionist/pianist Luca Venitucci, the quartet employs a style of minimum output with the maximum bang. The pieces are wildly pensive and stylistically calm. Some of the best moments jump out unexpectedly, as on "mmm", where high-pitched cymbals are heard along an electronic ear-popping zither, while Thieke plays a lovely alto clarinet motif along-side himself. Elsewhere - as on "Der Verfolger" - Thieke duos on clarinet with Venitucci taking over on accordion. Some really lovely phrases are here to be heard. While much of the record resembles something that could be labelled as jazz, chunks of it are actually fall more under the processed electronic domain. Great examples of prepared piano are heard on the closing "Einen Käfer Werfen", while tinkling percussion accompanies Thieke's slowly developing clarinet lines. Perhaps the most jazzy of all Charhizma records released so far and perhaps one of the most delicate one of them all. Der Berliner Klarinettist und Saxofonist Michael Thieke hat seine Wurzeln sowohl im (Free) Jazz als auch im Berliner Improv-Umfeld. Auch die Musik der Combo Unununium spielt mit diesen beiden Stilen, so dass das Quartett mal groovt und sich dann wieder auf konkrete Sounds konzentriert. Ungewöhnlich auch die Instrumentierung; neben Bass (Derek Shirley), Schlagzeug (Eric Schaefer) und Thiekes Blasinstrumenten spielt Luca Venitucci Akkordeon und präpariertes Klavier. Genreübergreifend spannend. IMMENSO. Il berlinese Thieke, di casa a Roma come nella sua città, è clarinettista e sassofonista. Dedito solitamente a una ricerca che si conviene di definire «estrema» (ma è tempo di vederla come la più normalmente aderente alle richieste di innovazioni del linguaggio musicale oggi), qui decide di sperimentare anche una più cantabile escursione in territori contigui al jazz. Adotta una sonorità che ricorda il grande Jimmy Giuffre e con la collaborazione di Luca Venitucci (pianoforte e fisarmonica), Derek Shirley (contrabbasso) e Eric Schaefer (batteria) sforna una serie di nove brani uno più delizioso dell'altro. Non mancano passaggi «rumoristi» ma prevalgono le atmosfere intimiste e quelle vivacemente informali. Con gusto e inventiva di altissimo livello. Charhizma presents a split album in which jazzy experimental tunes play an important role. The Berlin clarinettist and alto saxophonist Michael Thieke and his (combo) colleagues Derek Shirley (bass), Eric Schaefer (drums) and Luca Venitucci (accordion) change styles regularly. Micro improvisation interchanges with groovy jazz. An album on which borders are crossed rapidly; one moment laid back atmospheres, the next energetic clarinet work or tingling glockenspiel. Everything is possible and nothing left out. Michael Thieke (clarinetto, sax e zither) e gli Unununium- Derek Shirley (basso), Eric Schaefer (batteria) e Luca Venitucci (fisarmonica e piano preparato)- danno vita a un gustoso CD di jazz surreale, tinto ora di flebili visioni folk (If I Think, Again, Of This Place), ora di vaghe allusioni bop-exotiche (Fünf Treppen, Der Idiot), ora di riduzionismi avant (Portnoy) e così a seguire fino alla fine. Disco strano e strambo, simpatico e gradevole come certe pioggerelle d‘aprile. Può far pensare tanto a Piazzolla che a Capossela. Não é caso único (Axel Dorner é outro exemplo, e há quem mais faça questão deste tipo de abertura), mas Michael Thieke é dos poucos exemplos de recusa de dedicações exclusivas a um único conceito musical. Se em “Leuchten”, o seu solo absoluto em clarinete alto dentro dos parâmetros microtonais e de laboração das texturas que identificam o chamado “reducionismo” improvisacional, o ouvimos a recusar não só a noção de fraseado como a própria notação musical, substituindo-a por um trabalho que associa de modo particularmente audaz a acção do sopro, da saliva e da língua (o que repetiu em “Kreis”, com Ernesto Rodrigues, e em “7x4x7”, com os Schwimmer), já em “Where Shall I Fly...”, na companhia de Derek Shirley (contrabaixo), Eric Schaefer (bateria) e Luca Venitucci (acordeão e piano preparado) e somando aos clarinetes a utilização de um membro da família dos saxofones, ouvimo-lo reconciliado com os primados do free jazz. Há composições e até linhas melódicas, foram definidas métricas de propulsão rítmica e o mui clássico lirismo marca presença, por vezes mesmo com uma dimensão poética de muito bom gosto: o que outros invectivariam como uma capitulação, Thieke assumiu enquanto desafio, parecendo acreditar na máxima que diz que a absoluta liberdade pode ser uma prisão. Ainda que o seu outro lado transpareça aqui ou ali, este é um Thieke “straight” e swingante. Ou seja, um músico de jazz (tocou nessa qualidade com, por exemplo, Billy Bang, Steve Lacy, Jim Black e Gebhard Ullmann, e é claramente nesse território que funciona o seu grupo Dok Wallach, especializado no repertório de Charles Mingus) com suficiente discernimento para considerar que nada há de incompatível entre o universo sonoro cageano que aqui se aplica, por meio, designadamente, de técnicas extensivas de utilização dos instrumentos, e a rítmica marcada com que sustenta as suas construções. Ist jetzt das Jazzalbum auf dem elektroniklastigen Charhizma-label erschienen? Der offenbar willkommene Anlass kommt in Person des Berliner Saxofonisten, Klarinettisten (und Zitheristen) Michael Thieke daher und landet hier schön versponnene Sounds in klug erdachten Strukturen, versehen mit hübschen Titeln; mein Favorit: „nach aussen gewölbte Mönche“, andere wie „portnoy“, „der verfolger“ und „der idiot“ verweisen eindeutig auf Querverbindungen zur Literatur-oder bilde ich mir Roth, Cortazar und Dostojewski nur ein. Überhaupt fällt Thieke in letzter Zeit auffällig oft angenehm auf, sei es als Teil der „Hotelgäste“ (siehe freiStil Nr. 5), sei es als „Nickendes Perlgras“, sei es in Paed Concas „migrat(i)on“-Projekt. In Balance hält Thieke mit „unununium“ reflexartige Komposition und eingefrorene Improvisation, sodass keine von beiden auf einer Seite herunterfällt. Alle bleiben sitzen und spinnen weiterhin wunderhübsch vor sich hin. Von Zeit zu Zeit passiert fast nix, bissel ein Akkordeon vielleicht, ein wenig Metall scheppert, etwas pfeift, prima. Erhältlich im Feinkostladen ihrer Wahl. He’s a part of a community in Berlin that is known more for their use of extended technique and minimalist tendencies, and has been a part of three releases on Creative Sources, the Portuguese stalwarts of restrained improvisation. But Michael Thieke isn’t solely a proponent of such difficult work. Where Shall I Fly to Not Be Sad Again, My Dear?, the debut recording by Thieke’s Unununium, isn’t as Romantic as its title might imply, but those listeners looking for footholds are more likely to find them here than in Thieke’s other work. “If I Think, Again, of This Place” opens the album with Thieke tying melodic fragments in small knots over a rather minimalist background created by his collaborators. “Fünf Treppen,” however, begins with an upbeat rhythmic statement from bassist Derek Shirley and percussionist Eric Schaefer, and while the track’s primary voices – Thieke’s saxophone and Luca Venitucci’s accordion – spend much of the track simmering in cycles of terse repetition, the track is indicative of Thieke’s flirtation with more traditional jazz forms throughout the rest of the album. “Der Idiot” waddles with an off-kilter rhythm, spotlighting Venitucci’s prepared piano and on top of some irregular support from Shirley and and Schaefer, but Thieke’s playing, suspended over the track’s patchwork backbone, is a ribbon of relaxed accompaniment, fragments of an unknown ballad stretched past recognition, peppered with quick, twisting phrases. There’s a noir-ish tone to a significant portion of the album’s sound, dark and vaguely mysterious, but not so stylized to seem overdone. Thieke is decidedly the focal point of Where Shall I Fly to Not Be Sad Again, My Dear? ; not only is he the composer of the bulk of the album, but his playing is often in the foreground of the performances. Luca Venitucci, however, is often the group’s most interesting cog, as his accordion and prepared piano introduce novel voices to the fray, and his playing is frequently the music’s most colorful. It’s also a significant part of the shading Thieke uses to tint Unununium’s music, which, even if it’s some of Thieke’s most accessible, is not a simple stroll in the park. La musica ed i gruppi del clarinettista e sassofonista tedesco Michael Thieke hanno la costante della variabilità e quindi della sorpresa per chi lo ascolta. Il suo è un percorso frastagliato: da interprete della musica di Charles Mingus al trio di clarinetti di Geb Ullmann, restando in ogni caso fedele alla causa dell'avanguardia. Il quartetto Unununium esplora atmosfere e contesti differenti fra di loro, lenti e pensosi come il brano di apertura, in cui il suo poetico clarinetto si abbandona alla semplice melodia o più accese quando passa al sax alto con accenti braxtoniani. Le percussioni di Eric Schaefer danno un aspetto particolare a questa incisione lasciando da parte qualunque swing in ritmi che sembrano provenire da orologi meccanici. Un'originalità che viene ben integrata fra i suoni straniati della fisarmonica e le pulsazioni del contrabbasso. Ciascun brano ha una sua precisa ragion d'essere affrontando composizioni del leader o del gruppo con originalità di intenti nelle esecuzioni. Il repertorio è comunque giocato su un'ambiguità di intenti che è accattivante, fra l'urlo del free ed un minimalismo delizioso che gioca fra accentuazione della melodia e destrutturazione della stessa in espressioni quasi angoscianti che danno un senso di partecipazione intenso da parte dei musicisti. Questo nuovo tassello nella discografia di Thieke è tuttavia solo una parte di un mosaico che emerge a poco a poco fra gruppi e strumenti diversi in esibizioni per tutta l'Europa. Il suo è un percorso che non ha ancora una direzione precisa e la cui forma dipende dalle situazioni ed ispirazioni che affronta insieme ai colleghi musicisti: l'importante è volare, come dice il titolo, in posti dove non si è tristi! This is a truly experimental record where Michael Thieke delivers intense experimentation with clarinet and sax while the other musicians construct impressive sounds and atmospheres with their instruments. There is a good combination between exploration of new sounds and melodies. I like a lot the accordion and piano that is really experimental but at the same times gives sort of a "french touch" to the music adding some melodies. There is good interaction between the duo Thieke /Venitucci with the rhythm section creating original and challenging passages all over this recording. En multipliant les directions et en ne se pliant à aucun diktat, le Ununnunium de Michael Thieke avance libre et décomplexé. Et si l’on excepte Der Verfolger, vrai faux reggae et vraie faute de goût, on se surprendra à aimer profondément une musique finalement évidente et peu taillée pour le mystère. On trouvera ici des lignes fuyantes (If I Think, Again, Of This Place), des strates naïves et répétées (Der Idiot), des frétillements d’acier (MMM), une esthétique free jazz mise à mal par un accordéon perçant et perturbant (Fünf Treppen). En ne choisissant pas une cordée plutôt qu’une autre, apparaissent le plus souvent des brides d’identité, des surgissements ranimés ; ici, on notera une facilité certaine à utiliser la répétition en lieu et place du phrasé instrumental. De quoi attendre les prochains disques et concerts de Michael Thieke –aujourd’hui membre officiel du Clarinet Trio- avec la plus grande impatience. Mezi Berlínem a Římem pendlující klarinetista a saxofonista Michael Thieke je živou definicí tvůrĊí svobody. Člen mnoha formací je doma tam, kde se stýká souĊasný jazz, nová hudba a volná minimalistická improvizace. Neexistuje však bod, z něhož by bylo možné jeho tvorbu uchopit, vyložit. Novým důkazem je debut jeho kvarteta Unununium, který vyšel na progresivní vídeňsko-berlínské Charizmě. Hudba je opřena o hutný základ inteligentní, ne však intelektuálské Dereka Shyrleyho (basa) a Thiekova Ċastého spoluhráĊe Erica Schaefera (bicí). Největším objevem je ale akordeonista Luca Venitucci , který dobře zvládá i preparované piano. Většina skladeb je vystavěna z prostinkých melodií resp. melodických fragmentů, které hráĊi trpělivě opracovávají. Nezřídka je soukolí skladby poháněno jen dvou- až Ċtyřtónovou kombinací, o to víc ale překvapí, co všechno jsou Thieke a spol. z tohoto absolutního minima schopni vyždímat.Svou dobrou techniku dává Thieke na odiv velmi zřídka, hlavně v energické Nach aussen gewölbte Mönche. PosluchaĊsky vděĊný je dialog s Venituccim, kontinuálně podporovaný verzatilní basou a bohatým arzenálem Schaeferových zvonků, chrastítek a kovových plíšků. Album tvoří přepestrou paletu velim různorodých kusů, jako celek ale nepostrádá vnitřní soudržnost a je poměrně dobře přístupné (což lze ve světě volné improvizace považovat za raritu). Pravděpodobně si najde ještě větší poĊet příznivců než Meat Hat jiného Thiekova projektu, Nickendes Perlgras (viz HV 2/06), oproti jehož vypointovaným mikroskladbám dává tento hráĊům zasloužený větší prostor k vyjádření. S triem Hotelgästa vstupujeme zase do trochu jiného světa, i když Thiekův rukopis se neztrácí. Jestliže Where shall I fly not to be sad, my dear? nerezignuje minimálně na ozvěnu jazzových postupů, Flowers you can eat už plně koupe v pomalu budovaných abstraktních plochách, v nichžustupují melodie a víceméně i rytmus do ústraní. Výsledek, který by mohl oslovit příznivce souĊasného ambientu, je osvěžující. Hravost a totální zaujetí zvukem vytěsnily jakoukoli stopu jazzové virtuozity. Hutné a trochu potemnělé drony se pomalu hromadí, kulminují a zase odeznívají- viz hlavně vulkanickou Moto. V táhlých, jemně modulovaných tónech dechů lze hledat asi jedinouspojnici s Unununiem. Improvizace Hotelových hostů (vedle Thieka kytarista Dave Bennett a opět basista Derek Shirley). ale ještě radikálněji sází na objevování nových zvukových dimenzí nástrojů, k Ċemuž slouží jak rozsáhlý rejstřík nestandardních hráĊských technik, tak zvukové možnosti studia. Výstavních kousků nalezneme na albu víc, emblematicky ale působí téměř Ċtvrthodinová Sleepy Lady, kterou udržuje v napětí jednoduchá kytarová smyĊka, jež v poslední třetině zaĊne zpomalovat. Typickým rysem nahrávky je vyvážený poměr mezi nevtíravou elektronikou a akustickými prvky. Nic naplat, Thieke je stylotvůrce na vrcholu sil. ...As multi-instrumentalist Michael Thieke leads his quartet on Where Shall I Fly Not to be Sad, My Dear? in a program of originals, the scene shifts to cool jazz and leading-edge creative gestures. The leader plays alto saxophone, clarinet and alto clarinet and zither; with him on this adventurous album are bassist Derek Shirley, drummer Eric Schaefer and accordionist Luca Venitucci (who also plays prepared piano). Venitucci’s accordion colors with snippets of sound delivered in brief bursts, while Thieke balances with equal and opposite actions. The session includes quite a bit of empty space where minor nuances fall into place casually. Founded several years ago with this May 2004 recording, Thieke’s quartet reaches out for the mechanical in what they perceive. Most of the CD follows an unyielding path where bits of music are tossed out with unmetered punctuation that flows in uneven streams. Clarinet, accordion, bass and drums put their muscles together in a tight pattern that brings anxious tension, wide-open spaces and forceful statements through improvised music. Along the way, a taste of ‘jazz’ surfaces here and there for a few brief moments. Michael Thieke is a german improvisor who lives in Berlin and Rome.Here he is joined by accordionist Luca Venitucci , bassist Derek Shirley and drummer Eric Schaefer.Some songs start just with a smooth jazzy groove (like the second song “fünf treppen”), but soon step into some wild free jazz. Others approach a a language that I would say its closer to a reductionism aesthetic (“portnoy”) with silence and a non-idiomatic language taking the role, exploring micro-tonality. Thieke musical lyricism is always rich and inventive, and the band always find great solutions to archive a deep, sparse, brilliant sound. For me its just like if John Cage and met a free jazz collective in the XXI century. Amazing. On n'entre pas comme ca dans l'univers de Michael Thieke. Il faut d'abord tenter quelques repérages, puis s'assurer qu'on est arrivé au bon endroit avant d'oser pousser la porte et vérifier que la maison est bien habitée. Rien à voir avec son compatriote, le screamer Peter Brötzmann, que l'on peut entendre à des kilomètres à la ronde! Ici, les indigènes cultivent l'intimisme et leur musique est si bien cachée qu'on peut aisément la cotoyer sans la percevoir seulement. Est-ce d'avoir, depuis peu, croisé la route d'Ernesto Rodrigues et de son label Creative Sources, un vivier bouillonnant d'inventivité mais goutant volontiers le silence et l'immobilité? Toujours est-il que ce saxophomiste et clarinettiste, vivant entre Berlin et Rome et partageant aussi facilement la scène avec Axel Dörner que Michele Rabbia, tisse sa musique de fils invisibles, laissant l'accordéon de Luca Venitucci suggérer les harmonies les plus subtiles quand les rhytmiciens structurent l'ensemble en un cadre aussi clair que discret. Derek Shirley à la contrebasse et Eric Schaefer à la batterie melent ainsi, en douceur, le drive inflexible et le swing aérien de poètes jumeaux étrangement soudés. Et dès la seconde écoute, tout cela fonctionne parfaitement, ce qui était tantot apparu légèrement falot et lontain acquérant, dès lors, une reélle présence: la clarinette incisive de Thieke dont la gestion de l'espace évoque, parfois, les expériences micro tonales d'un Joe Maneri, la sobriété de Shirley, capable, dès la seconde plage, de poser une walking implacable sur une suite harmonique à l'allure hasardeuse, ou le cliquetis percussifs et arythmiques de Schaefer, dont on devine rapidement qu'il a du souvent écouter le divin bazar de Paul Lytton. Mais surtout, ciment indispensable à l'équilibre général, il y a l'approche quasi plastique de Luca Venitucci, coloriste inspiré composant le tableau à la manière d'un Matisse, par oppositions de structures, de formes et de matières plus ou moins denses ou diluées, tantot orgue de l'eglise, tantot synthétiseur, tantot harmonium, et dont l'agencement parfait offre une toile de fon idéale aux traits inédits de Thieke. Vous l'aurez compris, ce disque pudiquement impressioniste, à l'abstraction modeste et aux ton pastel, n'entrera pas chez vous avec fracas ni certitude. C'est bien plutot à vous de faire, comme on dit, les premiers pas vers sa beauté délicate et de tenter, avec patience et curiosité, d'en percer le charme secret. Mais la récompense est bien à l'hauteur de l'effort demandé.